The second drawback of low inflation… is that it makes the adjustment of imbalances much more difficult. It is one thing to have to adjust relative prices with an inflation rate which is around 2%, another thing is to adjust relative prices with an inflation rate which is around 0.5%. That means that the change in certain prices, in order to readjust, will have to become negative. And you know that prices and wages have a certain nominal rigidity which makes these adjustments more complex. The third drawback has to do with the presence of a debt level, which, both for the private and public sectors, is still elevated. And with low inflation, the real value of this debt does not go down as fast as it would if inflation were higher, so it makes the adjustment of the debtors, the deleveraging, more difficult. What one sees is that the deposit facility is small for central bank standards. The facility under consideration is used by banks- we are not talking about negative rates on mom and pop savings accounts; at least not yet. In our assessment, the key implication of moving to negative rates is reputational risk: Northern European savers may lose the little confidence they have left in the ECB if their savings are explicitly robbed. A key role of a central bank is to foster confidence in a currency. Well, in this case, if the ECB wants to weaken the euro they may want to do quite the opposite but we caution policy makers that they are playing with fire. Policy makers, however, are concerned with the opposite risk: that low inflation is causing a revolt in weaker Eurozone countries where negotiating wages downward is incredibly painful. The final effect on the real economy depends, of course, on the demand for loans, but also on the state of health of the banking system. The euro area cannot really go back to serious growth if the banking system is impaired. A healthy banking system is more essential to the euro area than to other financial systems that are more market-based. 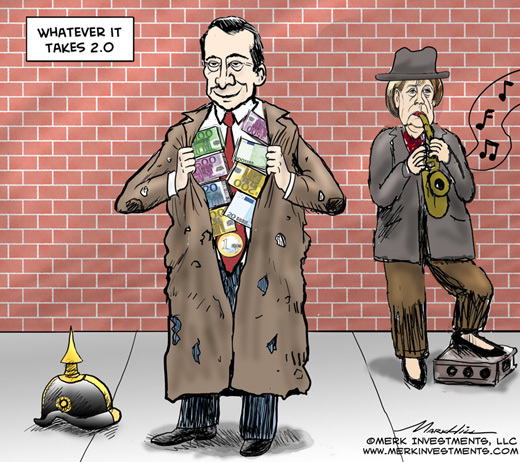 With weak demand in the economy and an impaired banking system holding back growth, what could QE do? 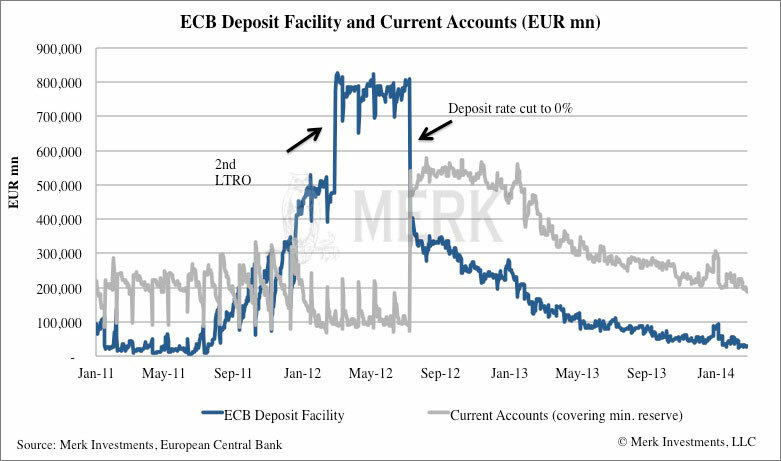 Draghi may not be able to boost real demand but he is certainly trying to address the impaired banking system. He has been asked in the past why he conducts the stress tests when such tests might discourage banks from borrowing money from the ECB (as this admits weakness); Draghi correctly points out that weak banks don’t lend whether stress tests are conducted or not. As such, it’s important to identify weaknesses; then have a plan to address them. What is happening is that new credit is actually expanding... at relatively decent rates. But... there is still deleveraging that has to take place... Improvements in lending to new clients, but at the same time redemptions of old loans weighing on credit figures. If you take the actual inflation of the first quarter of 2012, it was 2.7%, and now it is 0.5%. Of these 2.2 percentage points of difference, 70% of this is due to lower energy prices and lower food prices. Draghi’s “whatever it takes” attitude has made peripheral debt securities in the Eurozone appear to be low risk. 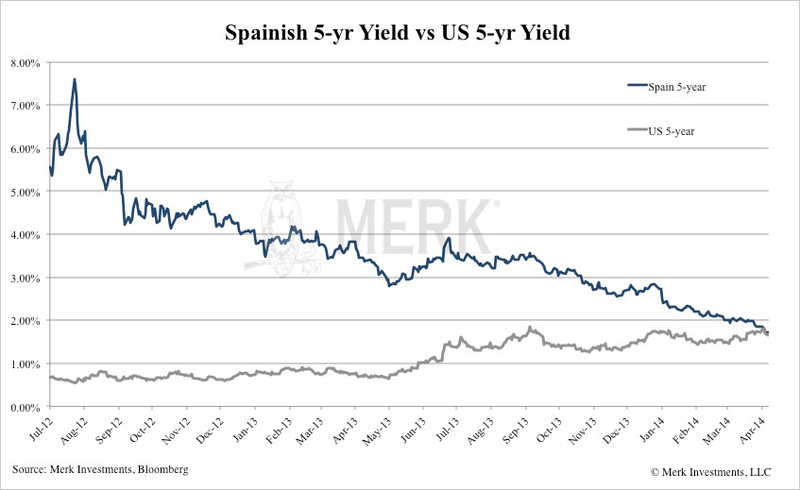 As such, the flight out of emerging market bonds didn’t make it back to the U.S. but instead to the European periphery. So what exactly should QE achieve if the verbal intervention has already lowered the cost of borrowing; de facto providing a substantial stimulus to the Eurozone periphery, even as ECB short-term rates have only been lowered marginally. There are obviously different preferences about which QE would be more effective, and we will continue working on that in the coming weeks... It is not easy to design a programme of QE on private debt that is large in size and doesn’t have risk for financial stability. That is why the ECB is so squarely behind the need to develop an ABS market, because that is where the largest pool of private sector assets lies, basically banking loans — as I said before, we are a bank-based economy. So, if we are able to have these loans being correctly priced and rated, and traded, like it would happen, like it used to happen in the ABS market before the crisis, then we naturally have a very large pool of assets. As a matter of fact, the ECB will present a joint paper with the Bank of England on this point at the next IMF meetings. A vibrant ABS market does not require a central bank to set it up. If it were such a great idea the smart kids at investment banks would have already developed this market. However, Draghi may not see these as a problem. That’s because, just like the OMT (Outright Monetary Transaction) program that turned around the fortune in the Eurozone after being announced in August 2012, this may never be implemented. Draghi may hope that the very fact that it is on the drawing board, will convince the markets that credit spreads should tighten and financing conditions should improve for private sector borrowers. The ECB may feel ever more pressure to act. At some point they will. Whatever action they take is likely to have unintended consequences that, in our assessment, are not worth the little impact they are likely to have (especially given that the signaling has done all the work for them). Expect more talk from the ECB. They want a weaker euro, but in our assessment are unlikely to get it. We continue to believe a euro of 1.50 this year is a possibility.